Even as India struggles to manage its plastic waste, a new report has raised concerns about the impact of generating a cheap and polluting fuel from used tyres in pyrolysis plants. The Guardian reported that, every month, the UK exports “thousands of tonnes” of used tyres to India. It suggests that most of these tyres are used by pyrolysis plants to produce fuel. Several of these plants flout regulations on pollutants released in the process. 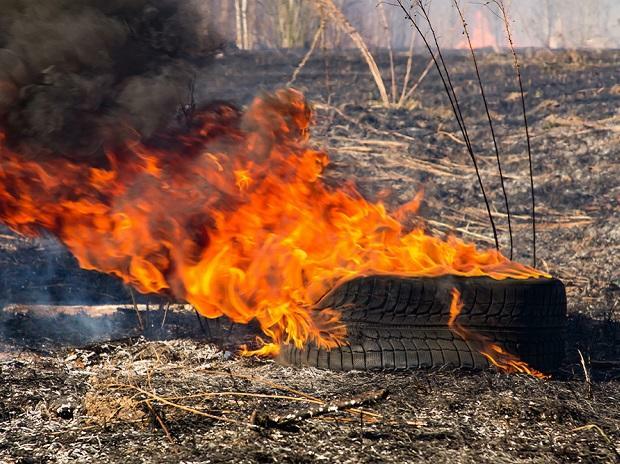 In 2014, the National Green Tribunal banned the burning of used tyres in the open or using them as fuel in brick kilns, because they produce toxic smoke known to be hazardous to health. Though the petition was brought before the tribunal to end burning of tyres during protests, it took a wider view of the problem. It asked the Maharashtra Pollution Control Board (MPCB) to look at ways to dispose used tyres safely. Subsequently, the board issued a set of guidelines, and pyrolysis was one of the procedures recommended. Pyrolysis is the thermal decomposition of tyres in the absence of oxygen. Shredded tyres, at temperatures between 250º C and 500º C, produce liquid oil and gases. Recovering energy in this process was deemed safer than traditional methods of burning. The pollution board, however, mandated that the pyrolysis plants dispose the carbon black – a harmful particulate matter pollutant – safely. Although regulations are in place, it is unclear how many pyrolysis plants comply with them. Reports of pyrolysis plants being banned regularly hit the headlines. In July last year, Haryana recommended closing three units for “grossly violating provisions under the Prevention and Control of Pollution Act and Environment Protection Act”. These units did not have effluent treatment plants or mechanisms to dispose carbon black. As with most pollutants, experts suggest that though recycling is imperative, the ultimate goal should be a reduction of usage. In India, tyre production has been on the rise and is expected to grow at a rate of 7-9% over the next five years. If guidelines on recycling the tyres continue to be ignored, the air pollution crisis in India will only become worse. Only incineration, thermal pyrolysis and plasma gasification technologies offer sustainable disposal solutions. Incineration is preferable to pyrolysis (which is unsuited for our municipal solid waste) and plasma technology (which is too costly). Waste-to-energy (WTE) plants are the best option. While this policy may provide a short-term solution to reduce solid waste, the impact of incineration on health remains a concern. Moreover, incinerator plants often shut down due to unsuitable waste feed and high operational costs. In this context, there seems to be a conscious effort – often from parties with vested interests – to promote pyrolysis as a safer and efficient alternative. Over the past year, several articles have been declared the process as one that will help “India deal with garbage woes” or create “a healthier tomorrow“. Used tyres can be recycled through cleaner processes than pyrolysis. Through a technology called CRMB (crum rubber modified bitumen), rubber from used tyres is added to bitumen with crushed stones to lay roads. While this process was implemented by the Centre until 2010, it has been neglected since. In March last year, a panel discussion on utilising green technology to recycle used tyres suggested that contractors are deliberately avoiding this technology. The motive, it said, was to make more money by using the tyres to produce fuel through pyrolysis and other processes. The government has been working on a legislation to change the way tyre manufacturers work. A draft law was presented to the Ministry of Environment and Forests in 2017, but it is unclear if any progress has been made since. Reports said the draft waste tyre management rules “envisage the creation of authorised waste collection and storage centres”. Apart from ensuring that waste tyres are managed, the rules also sought options for recycling/re-use or recovery and ensuring safe disposal of waste tyres.